At the beginning of 2007, the Tasmanian Branch Rover Council purchased two Achillies 12ft 6in expedition grade self-bailing rafts, paddles, buoyancy vests helmets and safety equipment. The rafting equipment is stored in a custom built trailer that allows us securely store the deflated rafts and to transport the rafts on top when inflated. In 2011 a 9ft Incept 2 person inflatable kayak was purchased, in order to develop more river skills and more people getting on the water. To date the rafts have been used on the Derwent, Picton, Mersey and Leven rivers as well as places such as Brady's lake slalom course in the central highlands and are proving to be a great investment as well as a recruiting tool for Rovers. As the skill of our guides has increased, we have taken on more challenging rivers such as the North Esk and have undertaken overnight trips on the west coast. In the future we hope to undertake more trips on challenging water and more multi-day expeditions. We are currently implementing a training program which aims to train Rovers as guides for white water rafting within the scouting movement. 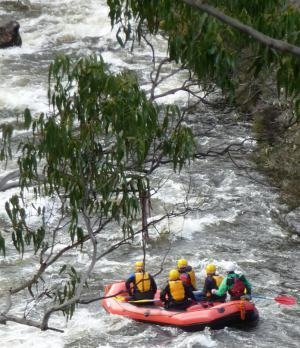 Some keen rovers have chosen to gain their Tasmanian Board of Canoe Education Whitewater Rafting Guide Certification, and are now able to guide school groups and run commercial Trips. Rover guides, once trained will be technically competent with controlling a raft using a range of strokes and paddling manoeuvres, negotiating or avoiding river hazards, launching and landing a raft, planning and running rapids, capsize procedures and river rescue. At present the training program is being run as a series of weekends with time between each for rovers to build on the skills they have learnt. Rovers interested in becoming rafting guides should undertake an introductory weekend which will then allow them to raft a number of rivers with other members who have completed sections of the course. In addition to the training courses guides will need to accrue 20 days of white water guiding before they can become qualified guides. If you are interested in taking your Crew or Venturers rafting or just organising a day for everyone then please contact the raft warden. Rates are $180 per day used for all the equipment in the trailer (Rafts, Inflatable kayak and associated equipment) and costs for other equipment – just ask! Wetsuits and additional rafts can be arranged at an additional cost if required.